(Figure 1). Schematic representation of a TCO–Tz ligation reaction. At low biomolecule concentrations (e.g. < 5 μM) where SPAAC falls short due to modest kinetics (e.g. 0.3 to 2.3 M–1s–1), and where copper–catalyzed alkyne–azide cycloaddition click reaction might compromise system viability, trans–cyclooctene–tetrazine (TCO–Tz) is the reaction pair of choice. This ligation chemistry is based on an inverse–demand Diels–Alder cycloaddition reaction between a trans–cyclooctene and tetrazine reaction pair, forming a dihydropyridazine bond (Figure 1). The chemoselective TCO–Tz ligation pair possess ultrafast kinetics (> 800 M–1s–1) unmatched by any other bioorthogonal ligation pair. Reactivity is clearly a prerequisite for applications performed under highly dilute conditions, for example, protein–protein conjugations. Protein–protein conjugations are often constrained to low protein concentrations (e.g. <1 mg/mL) due to limited availability of proteins and/or associated cost factors. Reactivity can be defined by the second order rate constant for the bioorthogonal reactant pairs. The higher the 2nd order rate constant for product formation, the more efficient the conjugation at low reactant concentrations within reasonable time scales, at near neutral pH, and without having to use a large excess of either biomolecule. 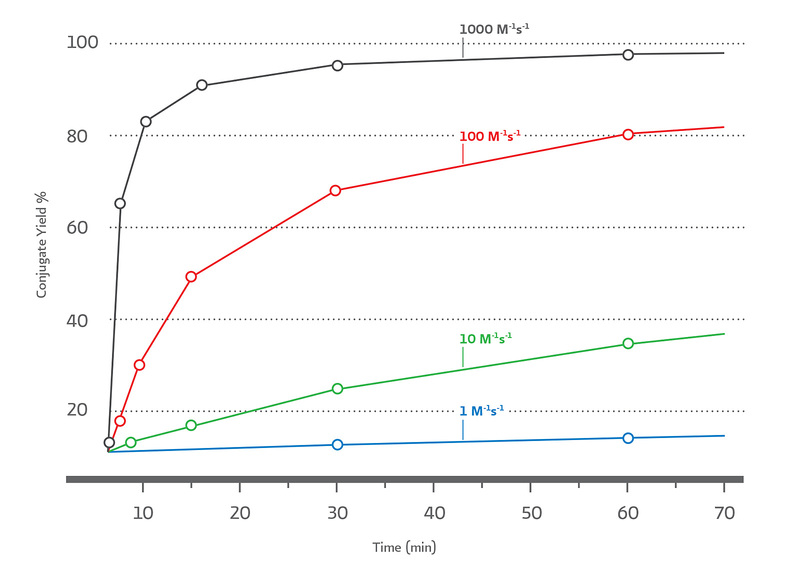 The relationship between2nd order rate constants (M–1s–1) for bioorthogonal reactants at 10 μM and the percent conjugate yield over time is illustrated in (Figure 2). The combination of ultrafast kinetics, selectivity, and long–term aqueous stability makes TCO–Tz the ideal pair in low concentration applications such as protein–protein conjugations. Five Goat IgG samples (100 μL at 5 mg/mL, 4 mg/mL, 3 mg/mL, 2 mg/mL and 1 mg/mL) were labeled in BupH buffer (pH 7.5) using a 20–fold molar excess of Tetrazine–PEG5–NHS ester. Similarly, 0.1 mL HRP (500 μg) at 5.0 mg/mL in BupH buffer (pH 7.5) was labeled using a 20–fold molar excess TCO-PEG4-NHS ester for 60 min. 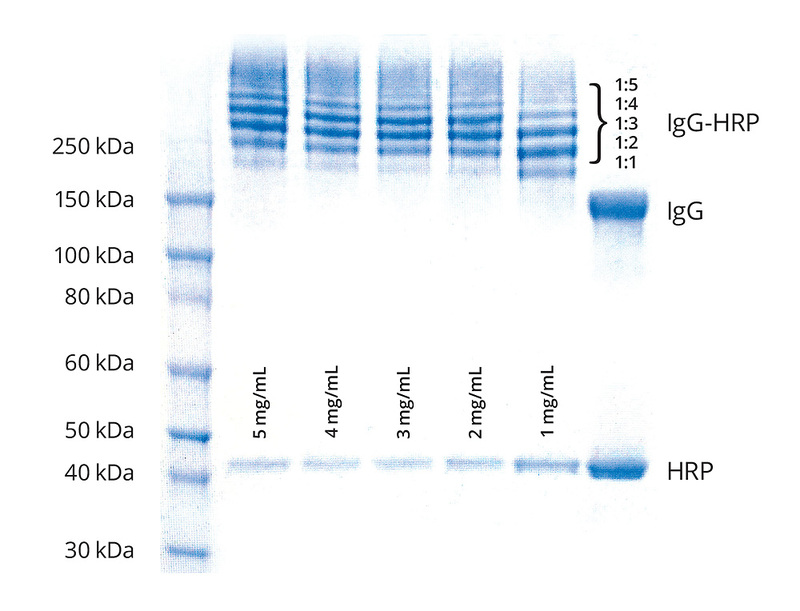 After removal of excess reagents and determining each protein concentrations 3-fold excess of HRP–TCO was added to IgG–Tetrazine at 5 mg/mL, 4 mg/mL, 3 mg/mL, 2 mg/mL and 1 mg/mL. After 60 minutes, an aliquot (1 μL) from each conjugation reaction was analyzed by SDS–PAGE.